BC is home to some of the world’s best alpine facilities. Millions of residents and tourists frequent these facilities every year to enjoy skiing, snowboarding, mountain biking, hiking, and alpine vistas. An integral part of this experience is exciting and safe transportation on passenger ropeways. Passenger ropeways are some of the safest forms of transportation. Safety and confidence in these systems has been achieved by combining technical advancements in design with a strong safety culture within the industry. Put simply, safety is achieved when passengers remain on their carriers, carriers remain gripped to the cables, and the cables remain on the sheaves. Even though significant advancements have been made in safety, every year BC experiences a number of incidents where the cable of a passenger ropeway departs from the sheaves. Within the industry, these incidents are called deropements. All passenger ropeways in BC are required to incorporate a means to retain the cable to the outside of the sheave assemblies should it depart from its normal running position. The means of retention must also allow for free passage of the cable (the haul rope), grips and carriers while the cable is either in or out of the normal position. Testing is required to demonstrate that free passage and safe clearances are maintained during anticipated operating conditions. Typically, cable retention designs have incorporated a series of angle brackets on the outside of sheave assemblies to catch the cable in the event of a deropement. These angle brackets are referred to as cable or rope catchers. To improve the likelihood of cable catchers to catch and retain the cable, a requirement in BC was added that retention means shall be located not more than half of the sheave’s diameter vertically from the normal position of the rope and that sensing devices are incorporated to stop the system as soon as possible following a deropement. In addition to these requirements, ski hill operators take a variety of preventative measures to minimise the likelihood of a deropement event. These measures include regular inspections of sheave alignment, automated cable tensioning systems, snow plowing/grooming protocols to create tracks to guide skiers and snowboarders in a safe path, and posting signage to instruct passengers to remain on the designated path. Even with the advances in requirements for rope catchers and the measures taken to prevent deropements, from 2009 to 2015, on average four deropements were reported annually where the cable is not retained. Deropements present a serious risk to passengers on aerial ropeways who could fall to the ground and to passengers on surface lifts who could be struck by the falling cable above them. This study summarizes reported deropement incidents occurring from January 1, 2009 to June 30, 2016. Surface ropeways that pull a standing passenger along a surface. Aerial (or above-surface) ropeways where the passenger is completely suspended in a carrier which is attached to a ropeway. Figure 1 shows the distribution between the different operating passenger ropeways in BC. There are approximately 232 passenger ropeways operating in BC. These are manufactured by approximately 23 different companies and installed at 51 different sites or ski areas. As illustrated in Figures 2 and 3 above, passenger ropeways operating in BC range in age of installation from less than a year to almost 60 years. 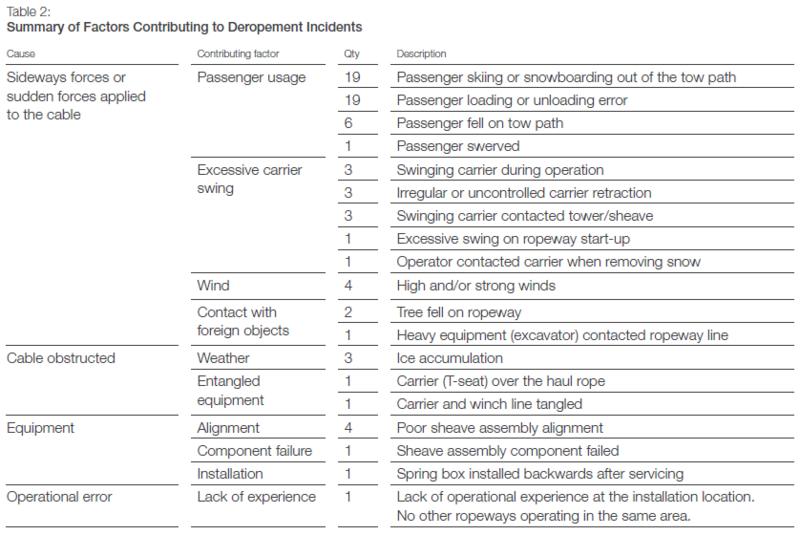 Figures 4 through 6 illustrate relationships between the number and the types of deropements and the types of ropeways involved in deropement incidents. 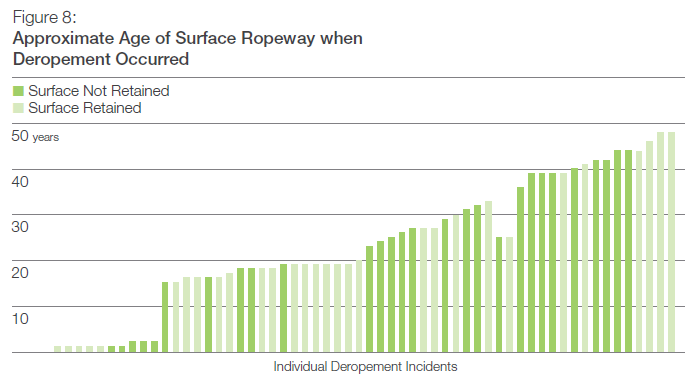 In 2013, six retained and one unretained deropements occurred on the same surface ropeway. Safety officers investigated the multiple incidents and the ropeway design. The investigation identified issues in the amount of tension in the system and safety officers worked with the owner to modify the design and installation to resolve the issue leading to these occurrences. 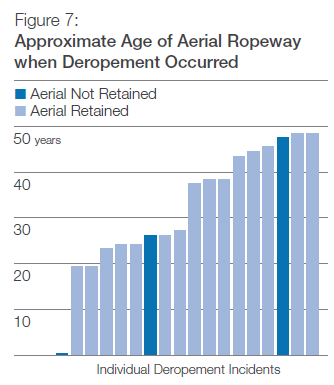 In 2014, two unretained deropement incidents occurred on aerial ropeways where passenger carriers fell to the ground. Reliability engineering widely uses a concept called the bathtub curve to describe typical failure rates over the life cycle of a product. At the beginning of a product’s life, increased failure rates may be experienced as a result of manufacturing quality errors or installation errors or the lack of familiarity of an operator with the product. Following this phase is a period where a lower failure rate is experienced, often a constant rate that is attributed to random issues. As the product ages and components begin to wear, an increased failure rate can be expected. service. There are no deropements reported to have occurred on equipment between three and 15 years of age. 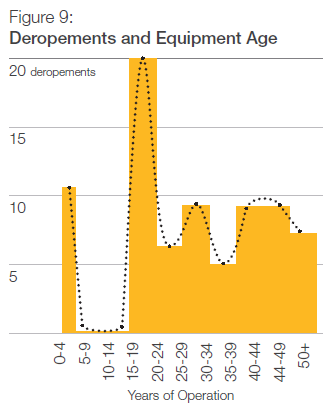 Equipment installations and operations that are more than 15 years in age experience an increased deropement rate that remains as that equipment continues to age until retired from service. Figure 10 expands upon figure 9 by further separating the distribution of deropement incidents into the identified cause categories. Each dot or bubble indicates a deropement incident. Figure 10 plots the deropements by age of the installation relative to the various identified cause categories and illustrates that there is no strong relationship between equipment age and any particular deropement cause. Five deropements since 2009 resulted in injuries to passengers. These incidents and injuries are summarized in Table 1 It is important to note that Technical Safety BC receives its injury reports and descriptions from operators or first responders at the time of, or immediately following, the incident. Injuries may develop after the initial reports were made to Technical Safety BC and the long-term effects of a resultant injury may not be recorded as part of our investigation. Note 1: Injury information is provided to Technical Safety BC by first responders and/or voluntary reports at the time of investigation. Injury information is provided to give some context relating to impact or scale of the incident. One out of 15 (17%) unretained surface deropements and one out of three (33%) unretained aerial deropements resulted with injuries to passengers. Generally, while unretained aerial deropements are much less frequent, they are more likely to result in injuries and those injuries are likely to be more severe. The most frequent contributing factor to deropement incidents relates to how directly passengers interact with the equipment either along the surface lift tow path or at the loading and unloading area. The second most common contributing factor relates to carriers swinging during operation. These two factors (passenger interaction with equipment and swinging passenger carriers) combine to have influenced almost 76% of all deropements. The listing of incidents at the end of this document further breaks down Table 2 into aerial/surface ropeways and retained/not retained deropements. These two predominant contributing factors account for over 87% of all unretained deropements in BC. BC has a thriving passenger ropeway industry that currently operates 127 aerial ropeways and 105 surface lift ropeways. Every year, passenger ropeways in BC report over 10 occurrences of a deropement incident. Incidents where the cable is not retained by the equipment, and subsequently falls to the ground, present a considerable risk to passengers or nearby people. 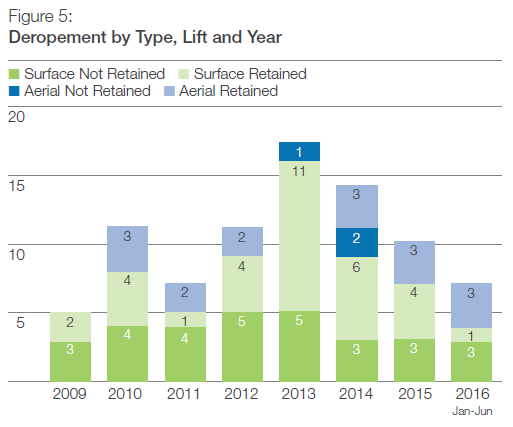 From January 1, 2009 to June 30, 2016, 82 deropement incidents were reported with an average of 7.9 deropements on surface lifts and 2.4 deropements on aerial lifts per year. Approximately 48% of surface lift and 16% of aerial lift deropement incidents resulted with the rope not being retained. A total of nine injuries (from five incidents) have been reported since 2009 as a result of deropement incidents where the haul rope was not retained. 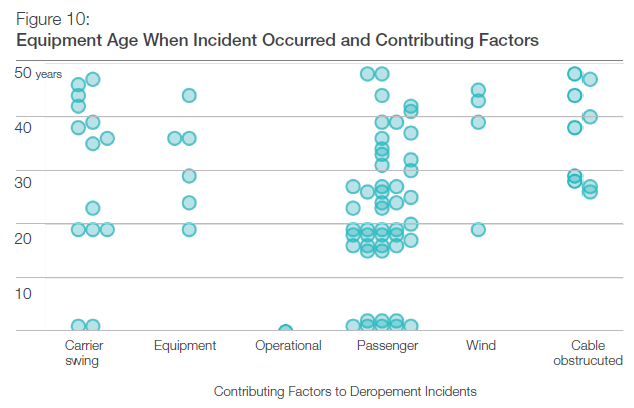 Deropement incidents were most frequent on equipment installations of zero to two years of age or between 15 and 20 years of age. No deropements were reported to have occurred on equipment installations that were between three and 14 years of age. The vast majority of the deropements are a result of sideways loading on the cable. These sideways loads were induced by either direct passenger activity such as skiing out of the designated path on surface lifts or falling, or by unintended contact from a swinging passenger carrier (chair or T-bar) and other parts of the ropeway equipment. Deropement Incidents (2009 - 2016) are provided via a downloadable .CSV file. Operational error Lack of experience 1 Operators lacked operational experience at the installation location.